asvi.com ASV Holdings Inc., an industry-leading manufacturer of all-purpose, all-season compact track loaders and skid steers, offers the large-frame, radial-lift RS-75 and vertical-lift VS-75 skid-steer loaders. ASV designs and builds the RS-75 and VS-75 with unique, dedicated skid-steer frames, ..
geophysical.com GSSI, a leading manufacturer of ground penetrating radar (GPR) equipment, has enhanced its StructureScan Mini XT – the newest generation of the company’s popular all-in-one concrete inspection GPR system. A new drill hole feature uses a 3D data processing detection algorithm to eval..
www.inrock.com XTR-W, INROCK’s newest reaming platform, delivers a high quality alternative to traditional “split bit” rock reamers. The streamlined and durable design utilizes INROCK’s proven segment technology to deliver a performance drilling tool at an attractive price point. Available in MT o..
Ditch Witch, a Charles Machine Works Company, released a new, advanced lineup of vacuum excavators to boost operator productivity and versatility on municipality and underground construction jobs. The new HX-Series features innovative and patent-pending designs that meet the diverse and evolving cus.. Featuring web and mobile applications, the new HCSS Plans digital plan management solution connects the office to the field to avoid costly mistakes and rework. It allows superintendents and project managers to efficiently manage changes and markups to project drawings and plans, ensuring those in t..
Ring-O-Matic’s 350 VX HiCFM gives municipal crews and small horizontal-directional-drilling (HDD) contractors the quickest way to safely and neatly expose water and sewer services. The truck-mounted unit can be easily mounted on a medium-duty carrier, guaranteeing always-legal road weights and easy.. The new H-Series 2.0 wheel loaders from Volvo Construction Equipment take a proven machine and add the latest technology, including the next-generation OptiShift and new load-sensing hydraulics and transmission. The result is a wheel loader lineup that promotes faster cycle times, delivering up to 1..
Elgin Separation Solutions has introduced a new waste drilling fluid management system for the horizontal directional drilling (HDD) industry. What sets Elgin’s CSI-D4 Waste Management System apart from conventional fluid cleaning equipment is a fully integrated vertical cuttings dryer (VCD), expla..
Madewell Products Corporation (Alpharetta, Ga.) manufacturer of corrosion-resistant protective coatings, concrete restoration products, and specialty application equipment, welcomed two additions to its team. Craig Closser, business development, brings 22 years of concrete restoration experience. H..
Jeff Shaw joined HalenHardy LLC as partner and vice president of Sales. Building on his experience as a sales leader in the work truck and heavy equipment industries, he is responsible for building the HalenHardy, LLC global sales team. Bellwood, Penn., HalenHardy provides products and services spe..
Martin Dana joined HOBAS Pipe USA, the leading supplier of large-diameter fiberglass pipe in North America, as the new vice president of Sales. Over his 28-year career, he has gained functional expertise in finance, operations and sales; in the steel pipe business for the water market, and oil and g..
Garry Haferbier was promoted to national sales manager at Allen Engineering Corporation (AEC), which designs, engineers, manufactures and markets concrete and related equipment through a global network of dealers and rental centers. With more than 35 years of experience in the light construction equ..
Mark Wysk joined Guardair Corporation, a leading manufacturer of OSHA-compliant safety air guns and pneumatic vacuums, as the new director of Global Supply Chain. He brings 30 years of industrial purchasing management experience, including international sourcing, tool industry knowledge and material..
Rick Prosser, P.E., joined the national engineering, geomatics and planning firm as chief growth officer. In this newly established position, his responsibilities include top-line growth, profit and loss financial performance, project delivery, strategic direction, performance management, and direct..
Steve Jenkins was appointed as the new president and CEO of SpectraShield Holdings LLC. He has a successful, 25-year track record of developing high-quality service providers in the environmental protection industry. SpectraShield Holdings is the parent company of SpectraShield manufacturer, CCI S..
Wayne Swafford, P.E., S.E., was named as the president of Lockwood, Andrews & Newnam Inc. (LAN). Dennis Petersen, who served as the firm’s president for the last 20 years, will continue as the president of LAN parent company, LEO A DALY. In his new role, Swafford is responsible for the firm’s direc..
komatsuamerica.com Through its subsidiary F and M Equipment Ltd., Komatsu America Corp. has entered into an agreement to purchase the assets of PBE Group – consisting of Pine Bush Equipment Co. Inc. and East PBE Inc. Subject to a period of due diligence and final approval of Komatsu Ltd. (with the..
Brian Metcalf, president and CEO, purchased Pella, Iowa-based Ring-O-Matic, a construction equipment company specializing in design, manufacture and customization of vacuum-excavation. “The timing was right,” Metcalf said, “And, of course, location was a prime consideration.” He had returned to his..
allu.net For the third year in a row, ALLU’s Pennala, Finland, manufacturing plant had no reported accidents. This tremendous achievement is due to the ALLU team embracing the concept of total health and safety in the factory, with the well-being of the ALLU staff being paramount to the production..
For the second year in a row, RIDGID is rewarding its most passionate fans with an all-expenses-paid, VIP trip, July 11-13, 2018, to its world headquarters in Elyria, Ohio, about 30 miles west of Cleveland. Six winners of the RIDGID Experience Contest will receive a prize package that includes: .. Efficiency Production supplied the shoring solution for a complex infrastructure project in Columbus, Ohio. Installing a new sewer system actually involved four different excavation points, each a different depth and with different-sized pipes, structures and/or manholes to install within; and some ..
Ditch Witch, a Charles Machine Works Company, recognized individuals and dealerships that exemplified the highest level of product support and service worldwide throughout 2017. Jon Ahlman, Ditch Witch of Arizona, received the 2017 Harold Chesnutt Award honoring the parts manager who best exemplifi..
hcss.com HCSS, a leading developer of software for the construction industry, hosted its annual Users Group Meetings (UGM) in Houston. Nearly 1,500 users of HCSS estimating, construction time card and job reporting, dispatching, safety, equipment maintenance, telematics, and other software attended.. The Fiber Optic Sensing Association (FOSA), the world’s premier trade association for distributed fiber optic sensing (DFOS), released FOSA Installation Considerations for Pipelines, offering guidance on the selection and positioning of fiber optic cables to maximize the benefits of DFOS along pipel..
Due to their reduced environmental and community impact, trenchless technologies are increasingly preferred by municipal engineers and project owners – even required, in some cases – for rehabilitating and renewing the aging underground water infrastructure. One trenchless method, Sprayed in Place ..
Professional Pipe Services Inc. (Pro Pipe), a leader in underground pipeline assessment and repair, and Perma-Liner Industries, a leading manufacturer and supplier of trenchless pipeline rehabilitation equipment and materials, are partnering to provide main/lateral connection lining services nationw..
It’s been more than three decades since Tom Iseley moved to Louisiana and joined the Purdue University faculty, but he’ll never forget his first meeting with Vic Weston. Iseley was leading a research program at Purdue for the state Department of Transportation, which wanted to know more about how t.. Break Rates for Almost 1/2 U.S. Water Mains Up More Than 40% in 6 Years Utah State University’s (USU) Buried Structures Laboratory has published a second, comprehensive study on break rates of the most commonly used water pipe materials titled, Water Main Break Rates In the USA and Canada: A Compre..
A record crowd of 508 people, including 75 first timers, attended the Distribution Contractors Association Annual Convention at the famous Monarch Beach Hotel in Dana Point, Calif., Feb. 25 to March 1. The ocean-front venue provided breathtaking views and excellent facilities to accommodate the var.. The Great Lakes region is blessed with abundant fresh water for its rivers and lakes. Water as a resource and method of transportation was an important factor in Akron, Ohio, blossoming as one of America’s early manufacturing hubs during the late 1800s and early 1900s. But it was this industrial pa..
It’s the law to dial 811 before any digging begins. That starts the process with the local (U.S.) One Call Center to have underground utilities marked, and damage to gas, electric, communications, water and sewer lines; service disruption; serious injuries and costly repairs prevented. The specifics..
Editor’s Note: This is the final installment of an exclusive four-part series outlining the risks of modern underground utility infrastructure construction and rehabilitation work. In Part 1, we introduced the concepts of underground uncertainties in infrastructure work. In Part 2, we looked speci.. The Common Ground Alliance (CGA) has firmly established itself as the primary driving force for preventing damage to underground utilities. 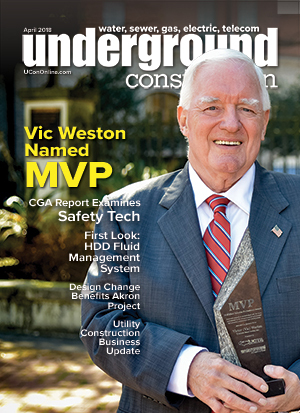 Composed of membership representing every area involved in the underground construction industry, CGA is best known for its Best Practices Guide, successful ef..
2017 sustained a stretch run of positive results for the utility and communications construction sectors. While the path to a federal infrastructure bill is still tenuous, investment is occurring at the state level, and investor-owned utilities and private communication companies continue to invest ..
President Trump’s infrastructure proposal presents a number of what can only be described as possible opportunities for the pipeline and underground sewer/water industries, because they are vague at best. Moreover, Congress is unlikely to swallow the whole expensive package, which covers highways, p.. The 63rd annual Appalachian Underground Corrosion Short Course (AUCSC 2018) will take place May 15-17, in Morgantown, WV. AUCSC offers more than 100 hours of basic, intermediate and advanced training that provides technical information about the causes and prevention of corrosion on underground str.. Recent infrastructure packages proposed by the White House and Senate Democrats note the need for more awareness and investment in stormwater management practices nationwide. Stormwater discharges from municipal drainage and conveyance systems – referred to as “municipal separate storm sewer systems.. The Texas Water Development Board (TWDB) approved financial assistance totaling $562,543,639 for water and wastewater system projects. Of this funding, $13.7 million was approved for rural water projects. $499.86 million from the State Water Implementation Fund for Texas (SWIFT) to the North Texas ..
By Robert Carpenter, Editor-in-Chief They still haven’t learned. To paraphrase an old saying, you can’t keep putting off until tomorrow what is needed today. When it comes to user fees for sewer and water systems, the inadequacy of rate structure price maintenance is rife with political interferen..